There was plenty of quarterback news to go around Monday morning when head coach Scott Frost held his first game-week press conference of the season, but there were also plenty of other notes and tidbits to go around. Here’s everything else we learned. >> Prep for Akron begins this week. With everything going on, starting quarterback Adrian Martinez wasn’t even asked about the Zips until the final question of his time at the podium. He, of course, made a joke about that before saying the team needed to be locked in. “They’re a good team,” he said. “They were in the MAC Championship last year. I don’t think the season finished for them the way they wanted it to, but I think their coaches do a really good job. There are good schemes on both sides. For what its worth, Frost mentioned the Zips are returning, he thinks, nine starters on defense. He was right. The head ball coach is definitely ready to go. >> To that point, Frost was asked if he was going to give himself some time to be sentimental before his first game at his alma mater kicked off. He said once game day hits, he puts his head down and goes to work. “I wish my job allowed me to stop and smell the roses a little more because it’s going to be special running out on the field in front of the home fans again,” he said. "If I’m doing my players a service, then I’m locked in on game-planning and calling the game and getting our guys ready to play. >> Offensive lineman Jerald Foster was asked about whether or not the team was physically ready to begin the season. He just laughed and said conditioning is not something people will have to worry about this season. The offense won’t be tired at the end of games, he says. Instead, Frost said the biggest thing that needs to happen between now and Saturday is winning prep week. Frost said his team is “as ready as we can be” and he’s confident in where they are. >> Wideout Mike Williams was asked if the starting quarterback decision changes much with the wide receiver room. Not much was the response. He said the receivers have developed chemistry with both quarterbacks. The only difference now is they know for sure who will be throwing them the ball on Saturdays. >> Right guard Tanner Farmer and Foster, the team’s starting left guard, were both asked about Martinez. Both said it’s their responsibility to protect him, not the other way around. >> Outside linebacker and Ole Miss transfer Breon Dixon wasn’t on the team’s initial two-deep on Sunday. Frost said Dixon can help the team this season and is good enough to play, but a redshirt year might be in the cards for him. Nebraska initially fought for Dixon to gain immediate eligibility in the spring, a battle they won, but that was before the new redshirt rules went into effect. The new rule, allowing players to participate in up to four games while still maintaining their redshirt status, changes things for Frost and company. It also means the travel roster is getting a bump. Frost announced Monday that the Big Ten will officially go from a 70- to 74-man travel roster this season to compensate for extra players that might play. >> Senior safety Aaron Williams, another guy who was unexpectedly low on the depth chart, will not be on redshirt watch, however. >> There hasn’t been a decision yet on how the Huskers will handle captains this season. Nebraska could pick four permanent captains or rotate amongst deserving candidates each week. Frost said the staff will meet this week to decide on how to handle that moving forward. >> Another position of interest that will feature a true freshman starter in 2018 is kicker. Barret Pickering won the job over redshirt freshman Cole Frahm. Frost says Pickering “doesn’t seem like a guy who’s going to get rattled.” Pickering had a consistent fall camp and Frost is excited to see what he can do in-season. “Hopefully his first kick’s a PAT,” Frost added. 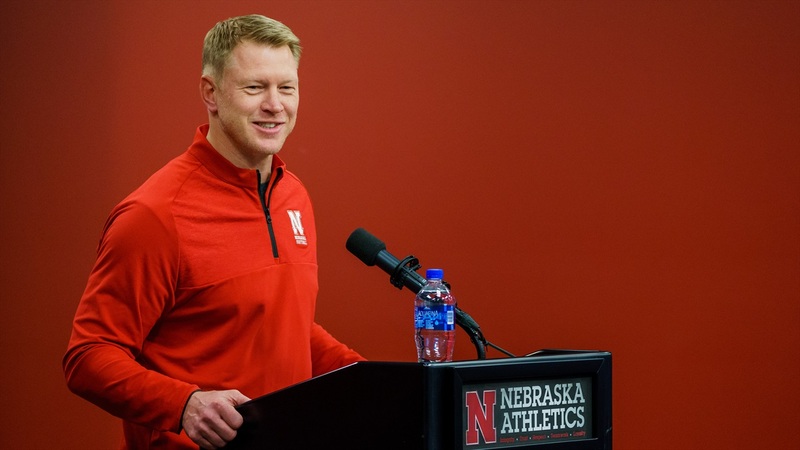 >> Asked about his thoughts on the Big Ten as a whole, Frost had high praise. “I’ve admired the coaching from two different leagues now,” he said. “I think last year the Big Ten was arguably the best in the country. I think the bowl games proved that. I think there’s some elite teams at the top and a lot of other teams that are good enough to be you any time and closing the gap on some of those elite teams. >> Frost was concerned about the secondary heading into fall camp. He’s not anymore. Several defensive assistants have made similar comments but Frost took it a step further Monday. “I felt great about the DBs all of camp,” he said. “I give those guys credit because that was a position I was worried about coming into fall camp. I think there’s been competition at some of those spots because of some of the new guys that have come in. Some of those new guys are going to play and a lot of the guys that have been here did a good job of stepping up and holding onto their jobs and improving their play. We’ve gotten really good play out of the secondary, a lot of credit to Coach Fish on that front. >> Farmer was asked about running back Devine Ozigbo and the work he put in this fall. Ozigbo was recently named the co-No. 1 in the backfield; Farmer said it was well-deserved. "Whenever you put in the work, you get what you deserve," he said. >> Members of the Husker defense have not yet received Blackshirts. Asked when that might happen, linebacker Mohamed Barry smiled and said it’s not up to him when they’re given, only that he’s done enough to earn one. >> There is tremendous confidence around the offense with a week to go before the season. How fast should fans expect the team to play in 2018? “Fast. Really fast,” Farmer said. “Hopefully the refs can keep up." How potent can the offense be? “I think you guys are going to find out this Saturday,” Martinez said. What kind of timetable is the team on right now compared to Central Florida’s the first time this staff embarked on a rebuild? Nebraska’s season kicks off against Akron Saturday at 7 p.m. on FOX.